Restored relationships and a peaceful heart thisPocket Inspirations book offers powerful truth andbeautiful design for only $4.99!At some time, every one of us has experienced thedisappointment of being hurt by another person? 's wordsor actions. And we often need help to move beyondfeelings of pain or resentment. 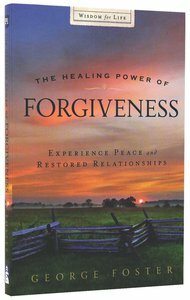 For those of us who findourselves in that place, George Foster offers practicalsteps to healing and forgiveness. Packed with compellinginsights and advice, this book leads us on a path ofrestoration and forgiveness we can truly live with. restoration and forgiveness we can truly live with. About "The Healing Power of Forgiveness (Pocket Inspirations Series)"
George Foster is currently the international pastor for Bethany International Ministries, a role that allows him to encourage, mentor, and provide pastoral care for missionaries around the world. He is the author of Following Jesus Christ, which has been translated into ten languages with more than a million copies distributed.